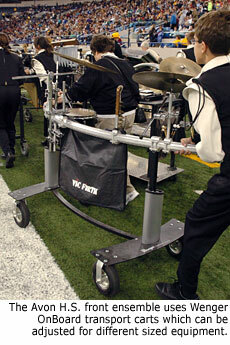 To get equipment on and off the field, the right set of wheels is essential for a stress-free marching band performance. Whether you utilize band boosters to build a cart or buy a ready-made option, these tips from experienced directors can help you make a good choice. While competitive on the field, most marching bands possess an amiable spirit off the field and are willing to share creative ideas for solving common challenges. One familiar discussion topic is effective equipment transportation; typical solutions are wheeled carts or racks. Commercially made options are available  often purchased by booster groups  but some bands try to build their own. Avon High School in Avon, Ind., has benefitted from hands-on creativity and expertise among its band parents, including those who work for local firms that manufacture precision auto-racing components. Avon parents built custom wheeled uniform boxes, each designed to hold 15 uniforms during both off-season storage and travel. These boxes include space for shoes and several shelves for hats and other miscellaneous items. Band director Jay Webb says, as in auto racing, successful marching band logistics often comes down to the right set of wheels. "We've learned that high-quality wheels on all our carts make a big difference," explains Webb, who says that small, hard wheels do not roll well over varied surfaces such as grass, gravel, dirt and pavement. Pneumatic tires offer definite advantages. Wayne Ivers, band director at Marshall High School in Marshall, Minn., ordered a heavy-duty marimba chassis with eight-inch pneumatic tires. "It's strong and sturdy," explains Ivers, adding that a cart with small, indoor casters might collapse while being moved across uneven or rocky terrain. "We can use these carts indoors or outdoors  we can't afford to buy two sets of everything," he notes. Whether you make or buy a cart, ensure it's designed for flexibility. Will its wheels work indoors and outdoors? Can it adjust to suit different sized equipment? Does it fit easily through a three-foot classroom door or inside a 6-foot-high trailer? To maximize your investment, transport carts should also provide storage capability. 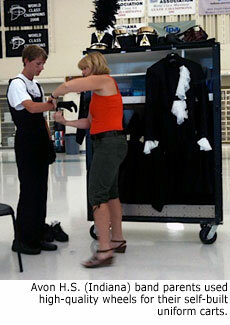 For example, the same cart might hold uniforms in a storage room but also roll outside onto a field, bus or trailer for competition. This saves time distributing and collecting equipment. Wenger Corporation developed its OnBoard(R) Transport Carts by listening to the needs of marching bands, drum corps and similar groups. OnBoard Carts are designed to facilitate transportation, logistics and storage, saving time and protecting valuable equipment, including uniforms and instruments. Gregg Nelson is a senior market manager with Wenger Corporation, Owatonna, Minn. He can be reached by email or at 1-800-4WENGER. For more information, visit www.wengercorp.com/onboard. Photos courtesy of Avon H.S. Band and Wenger Corporation.